Issues with teenagers up to approx 25 years of age? Problem: You have security issues with children or teenagers committing acts of anti-social behavior, creating noise disturbances or loitering with or without intent to do harm. You want them to go away or stop their behaviour but you do not wish to risk confronting them directly. Solution: Teen Away uses your computer as a way of generating unpleasant high frequency sounds that only children / teenagers can hear. Adults (anyone over approx >25 years of age) will generally be unaware of the sound. You run the software and generate a sound that they will want to get away from. How? : The limit of adult hearing is approx 13,000 Hz, the limit of child / teenager hearing can extend to 20,000 Hz+. This means that any sound between 13,000 Hz and 20,000 Hz will be inaudible to most adults and audible to most children / teenagers. Most modern sound cards and multimedia speakers can easily generate high frequency "sonic" sound in this range. Speakers that contain a tweeter element can often even play sounds up to 40,000 Hz. (Bat sonar operates in the region of 40,000 Hz to 100,000 Hz so there is no impact on bat-sonar, mosquitoes are said to be repelled by sound in the range of 15,000 - 240,000 Hz so the program may also keep mosquitoes away without needing ultrasonic electronic circuits). (1) If you wish, perhaps first verify that you have a modern sound card and reasonably good speakers. The frequency ranges may be contained in your system's manual. For example the most basic Sound Blaster sound card has a range of 10,000 Hz to 40,000 Hz "Frequency Response at -3 dBr = 10 Hz to 40 kHz". So 12,000 Hz to 22,000 Hz is well within its capabilities - the same is true of most modern sound cards. We have tested Teen Away with 5 year old desktop systems through to very basic Netbooks using internal speakers and have yet to find a system that cannot generate sound in the range of 12,000 Hz to 22,000 Hz. (2) Purchase, instantly download, install, unlock. (3) Connect speakers, use your main volume control to ensure that the system's sound is not muted or too low or high. Play some music to ensure that sound is operational. Run Teen Away. (4) Click on the "Test Volume" button. This plays a sound that contains a variety of frequencies between 500 Hz and 6000 Hz which anyone can hear. Adjust the volume so that the volume is high enough to be annoying but not so high that pain is generated. The volume should be tolerable even though the sound is unpleasant. This step is required to protect your hearing and the hearing of those around you. (5) Select up to 4 consecutive frequencies starting with 13000 Hz. Click on the "Start" button. If you and other adults can't hear anything then the setup / calibration process is complete. If some people can still hear a high pitched sound then select a slightly higher block of up to 4 frequencies until adults can't hear anything at all. When you close Teen Away your settings will be automatically saved. 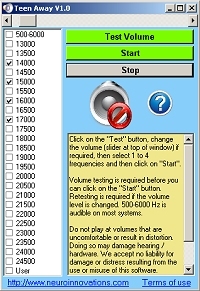 (6) When the need arises run Teen Away again and click on "Test" again briefly just to confirm that volume levels are still as they were then click on the "Start" button. Awareness of the sound is within 20 mins. Our standard terms and conditions and licence agreement terms apply. A 16 bit + sound-card and speakers is required. An new or external sound card is not necessary unless you have a very old or very low spec sound card. Older / low spec sound cards may not be able to play some of the higher frequencies or may generate distortion when attempting to do so. They may only generate distortion when attempting to play at hi volumes. Netbook use is supported - Tested on a very basic XP Home Netbook. Not available for Macs or Linux systems. No - there is no free demo and we do not accept liability if you are trying to install on a machine that has an ancient sound-card (if so you will need to install a new sound-card that is more up to date - they are inexpensive these days). See next question also. How can I test my sound card? This file uses similar frequencies - you will need a teenager to serve as a test subject (MP3). This is inaudible to most adults so keep the volume low to avoid hearing damage. Does the sound pass through walls? Do I have to test the volume with audible frequencies before playing the high frequencies? I hear a high pitched sound even when I close the program? You have overloaded your sound card and / or there was high frequency feedback from your speaker system that is looping. Reduce your volume levels and restart your PC if affected. Also consider reducing the number of frequencies selected. Do I have to have tweeters in my speakers? Can I wire up Tweeters and have no normal speakers at all? The following graph shows Teen Away with 14000 / 15000 / 16000 / 17000 Hz selected. You can see that no other frequencies are being produced and that the sound being generated is pure. 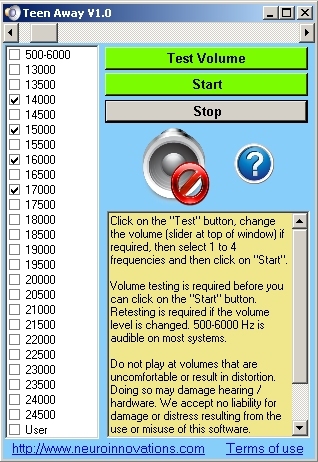 As with any other form of software that generates sound you have a duty to ensure that volume levels are kept low enough to prevent damage to hearing. Teen Away in part enforces volume level testing via the mandatory "Test Volume" facility. There are however ways of obviating this control measure such as by using volume controls built into speakers themselves. The risk is that inaudible high frequency sounds may be generated that may have volume levels that are above safe levels. For this reason we strongly encourage the use of the "Test Volume" facility when there is any change to the volume levels of the system or the speakers or attached amplifiers. Clearly there is no absolute guarantee that teenagers will be repelled and move away from the area. Installation support is UK based, free of charge and available by eMail. Updates are free. This product is updated by Autoupdate but is not part of the Therapists Toolkit.